Color changes in the ovarian eggs in female Hynobius nigrescens (Hasumi, 1996); dos = dilatable ovisac, fb = fat body, h = heart, os = ovisac (uterus), ov = ovary, pc = pars convoluta of oviduct, pr = pars recta of oviduct. Scale = 1 cm. (A) August: remaining ovarian eggs colored mint green, perhaps to provide camouflage in green algae-laden ponds. At this time, vitellogenesis (i.e., accumulation of yolk granules) begins (see Fig. C), after which melanin deposition is initiated in the surface layer of the eggs in September. (B) October: the entire eggs are dark brown. 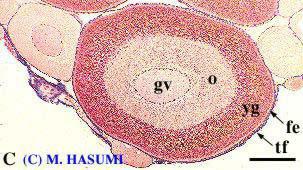 (C) Vitellogenic follicle from the August ovary (azan stain); fe = follicular epithelium, gv = germinal vesicle (nucleus), o = ooplasm, tf = theca folliculus, yg = yolk granules. Scale = 200 micrometer. Footnote (24 October 2016): The term "ovisac" is confused with "egg sac". Although McDowell and Shinozaki (2015) cited it as "deposited ovisacs (Hasumi, 2001)", there is no description about such a term (i.e., deposited ovisacs) in Hasumi (2001), and ovisacs are not physically deposited outside. McDowell, W. T., and N. Shinozaki. 2015. A synopsis and larval description of Hynobius kimurae Dunn 1923 (Caudata: Hynobiidae). Bulletin of the Chicago Herpetological Society 50: 13-18. Copyright 2002-2016 Masato Hasumi, Dr. Sci. All rights reserved.